MoBell Muscle Kit is innovative in the sense that it is the only equipment that provides portability, modularity, weight-training and unit-training. No other company has a mobile barbell system that breaks down and can be used as a fully Olympic barbell or curl bar. No other company has a modular bag that functions as a gym plate and as a regular fitness bag. No other company has a portable carrying case with Olympic-level strength-training equipment. The MoBell Muscle Kit complete with the first-ever patent-pending MoBell Bar: a full Olympic barbell and curl bar. It also comes our patent-pending portable, fillable Tactical Bags that are the equivalent of traveling with 16 weight plates so you can mix and match to get just the right weight without traveling with the weight. With the bar included, that’s a total of lifts up to 225lbs with the option to purchase additional MoBell Tactical Bags up to 700lbs! Maximize your workout routine the smart way with the MoBell Muscle Kit. Sturdy, versatile and portable, this set has it all for anyone looking to get a great workout on-the-go with free weights. Save the heavy lifting for your workout. Travel with the MoBell Muscle Kit. Travel weight of 75lbs, once set up, with a load capacity of over 700lbs*.The Kit is light-weight, portable, and provides full-gym functionality. It is fully compliant with road, rail and air transport and is incredibly secure and resilient. The MoBell Bar can be used as an Olympic bar OR a curl bar with our patent-pending bags, bumper plates or standard 2” gym plates. 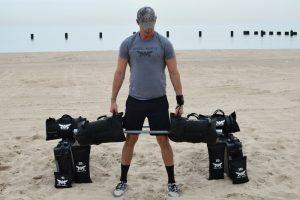 The MoBell Tactical Bags can be used on the bar as weights or individually for thousands of workouts. They are equivalent to 4 sets of 5-45lb dumbbells, a plate tree, or 4 sets of 5-45lb kettle bells. The 5, 10, and 15lb filler bags can also be used independently of the Tactical Bags for a variety of exercises.